Now that I have my radio and computer listening for & posting WSPR spots almost everyday while I am busy at work I am noticing that 5 watts seems to be enough power to make it across the pacific almost every morning. 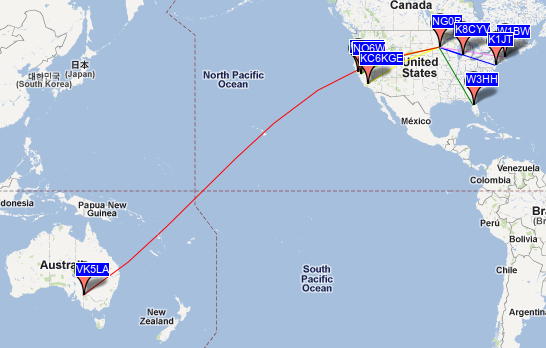 I am noticing that Australia to the central US looks like a pretty reliable path every morning recently at QRP levels. The map shows the 30m path around 8:20am central time.